Wagering money on the golf course makes the game a lot more fun and interesting, right? Absolutely, and betting on the golf course is almost as old as the game itself. Keeping track of different bets and results has always been a difficult task. Fact is, scribbling numbers on the back of a scorecard or relying on a certain player to remember everything is a recipe for confusion. Let’s face it, if you win fair and square you want an accurate accounting of your winnings. 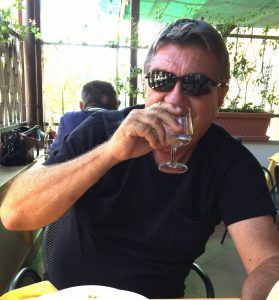 There’s nothing worse than wagering with a person who conveniently forgets he or she lost money to you on the course and you misplaced the scorecard and so you have no proof. 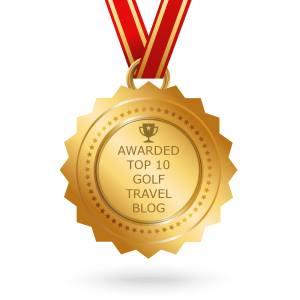 You can say goodbye to all the difficulties in golf wagering with Golf Money, the new app for iPhone and iPod Touch I recently discovered that allows you to accurately track golf related winnings and, of course, those dreaded losses. 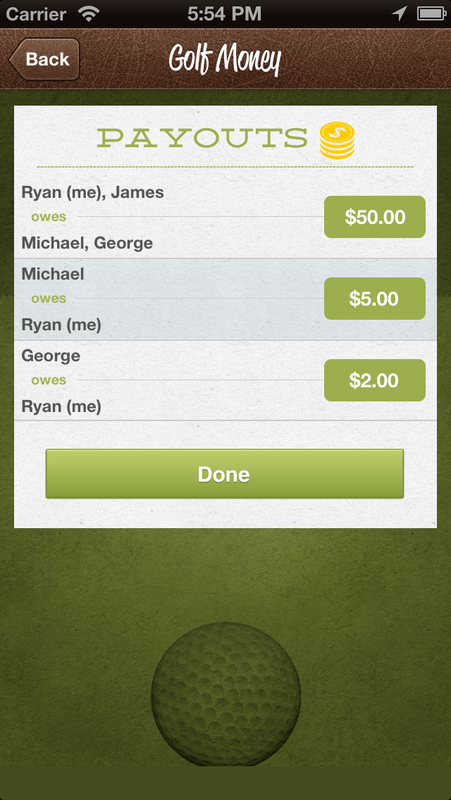 Golf Money is so easy to use, chances are, you’ll call your buddies up for some golf action right after you download. To get started, you simply enter the names of the competitors and their handicaps and the hole handicaps for the course you’re playing on. Now you’re ready to make your wager. 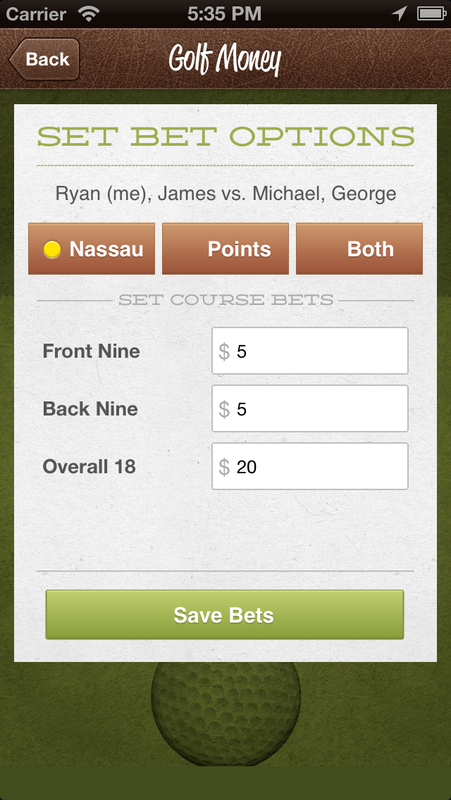 Whether you’re playing for Nassau or points, Golf Money automatically calculates payoffs each time you input scores. Everybody always knows where he or she stands in the competition with Golf Money. 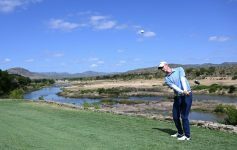 Golf Money has four modules that make it unbelievably easy to keep track of every aspect of the golf gaming experience, which allows you to thoroughly focus on your game and not who’s winning or losing. 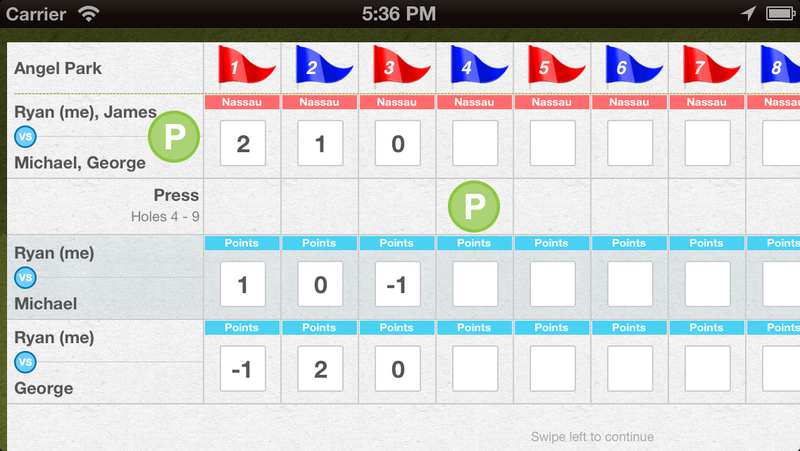 —Friends-This is the initial module where you list your opponents, partners or team members. Think of it as sort of an electronic line-up card. —My Bets-This module essentially operates like a digital scorecard. As long you input the correct player handicaps and hole handicaps, it keeps accurate accounting of all bets. 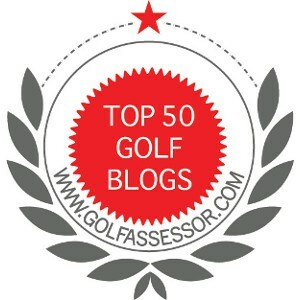 —Reports-If you love golf stats, you’ll enjoy this module which helps you see how successful, or, sadly, unsuccessful, you’ve been wagering against a particular player at a specific course. —My Totals-Everybody who puts a little money action on the golf course wants to know where they stand and this module does that for you. Here, you can review a timeline of your recent golf wager outings, see your total wins and losses and evaluate how you’re doing in the short or long term. 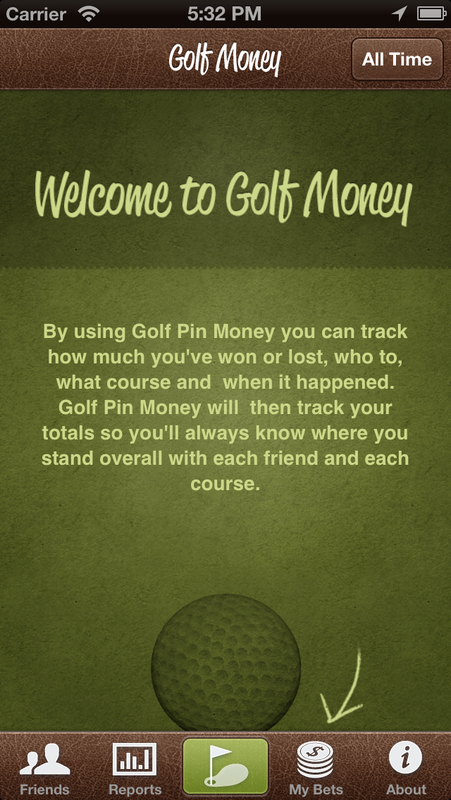 This is a must-have app for golf gambling enthusiasts. Why carry around a stubby golf pencil and rumpled scorecard to keep track of the gaming proceedings, when Golf Money executes the difficult math calculations and record keeping for you.